I told her I get ideas all the time; that’s what my sketchbooks are for — so when I sit down to work, I’m ready with all the ideas I want. Honestly, ideas are a dime a dozen. I get ideas all the time — sometimes at the most inconvenient times! I keep a sketchbook with me (or a notebook, at least) so I’m ready when an idea comes. My husband will vouch for my jumping out of bed a half-hour after we turned the lights off now and then so I can jot an idea down that came to me as I was trying to go to sleep. My sketchbooks are workbooks. 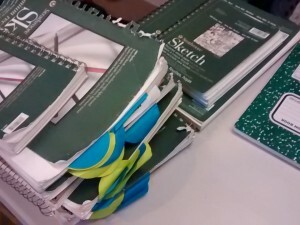 Besides storing ideas in them, I use them to work through compositions for paintings and to practice drawing. So when I sit down to a canvas, I’ve already worked through the painting idea in multiple pages of sketchbooks. Hopefully, I’ve also done some detailed practice sketches and drawings of poses or objects that will appear on the canvas. I do a lot of the work before I go to the canvas, so by the time I’m actually painting, there’s no waiting for my creative muse to show up. My muse is no rarefied deity descending when she pleases. She’s a secretary, who comes when she’s needed and helps get all the background work done, so when the paint’s against the wall, everything’s going as planned. As a professional creative, you can’t wait for creativity to strike. You must actively create the conditions for you to do your best work.